I am delighted to tell you that my second book ‘Little Bit More Silverware’ is super available worldwide on Amazon in hardback and Kindle, plus direct in hardback from Legends Publishing as well! This outstanding sequel is an exceptional souvenir of our 2014-15 FA Cup-winning campaign, as the season unfolded and we retained the famous trophy. With more top new exclusive exposés and revelations, I can assure you it is an outstanding signing for your book war chest. And the foreword is by the super broadcaster Mark Pougatch. Did you know he is little bit Arsenal supporter? I don’t know. Overall, Little Bit More Silverware is an exceptional gift, including for birthdays, holidays, or basically any day. 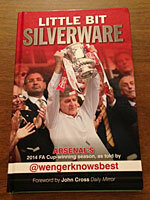 My debut book ‘Little Bit Silverware’ has over 223 pages of outstanding comedy and is a super souvenir of our 2013-14 FA Cup-winning season, written as that campaign unfolded as well. With many top top exclusive photo-spread exposés and revelations, I remain absolutely convinced it is of outstanding quality. 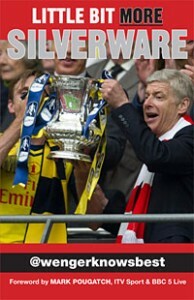 ‘Little Bit Silverware’ is available through Amazon worldwide in hardback and Kindle, Waterstones and WHSmith. Book Depository has free delivery worldwide for both of my books, for many countries. Which is outstanding. Overall, both of my books offer outstanding comedy for your war chest. Thank you for your interest in my affairs.